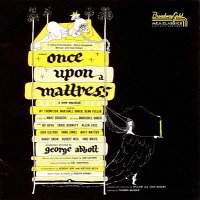 Original London Cast, 1960 (HMV/Sepia) (3 / 5) Although Carol Burnett did not star in the West End production of Once Upon a Mattress, another funny American lady did. Jane Connell, who would later achieve musical theater immortality as Agnes Gooch in Mame, made a valiant stab at swimming Winnifred’s moat. Her performance on this cast album differs from Burnett’s; Connell shrieks where Burnett would bellow, and instead of inhabiting the role as her predecessor did, Connell comes through in her own way as a fine musical comedian. Otherwise, the London cast is quite equally matched with the American, and Patricia Lambert’s veddy British diction adds an extra layer of mock operetta charm to the role of Lady Larkin. The recording as a whole is slightly more decorous than the rather boisterously vaudevillian American original, but what matters most is that Once Upon a Mattress is a good enough show to work well either way. [Ed. Note: Sepia’s CD also includes Ali Baba and the 40 Thieves, a children’s record that features songs with music by Mary Rodgers and lyrics by Sammy Cahn.] — R.B. 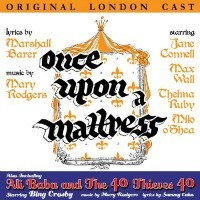 Broadway Cast, 1997 (RCA) (1 / 5) After nearly four decades and two televised productions (both starring Carol Burnett), Mattress made it back to Broadway, albeit with drab results. Some of the show’s charm was still evident, but more conspicuous was the by-the-numbers aura that permeates the cast recording. 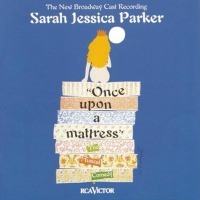 Alas, Sarah Jessica Parker was not an apt choice for the heroine; although her musical theater experience dates back to Annie, and her Winnifred was Tony-nominated, she just doesn’t cut it. Setting aside the untouchable Burnett template, Parker can only manage to serve up makeshift vocalism and indifferent comic timing. The remainder of the cast, the chorus, and the orchestra perform in acceptable “Broadway generic” fashion, although Lawrence Clayton’s vocal tone is very thin in “Many Moons Ago.” The main virtue of this recording is that it’s complete, but whose crummy idea was it to shoehorn a disco break into “The Spanish Panic?” Stick with Burnett and company. [Ed. Note: A third television production of Mattress, with Tracey Ullman as Winnifred and Burnett as Aggravain, aired in 2004 and is available on home video, but no soundtrack recording was released.] — R.B.